Brian showed me how the software worked so that I could help him prepare it for shot data collection. We had to update the current position each time Luis moved, and update the position of the land streamer each time we advanced it. It was good to have two people who could operate the software, because Brian’s helmet fogged up so that he couldn’t see the laptop screen. 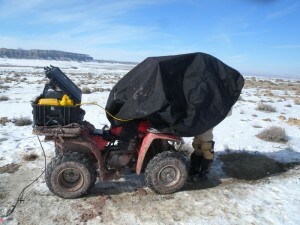 So we both hunched over the laptop, under the ATV cover we’d brought up with us to use like a photographer’s black drape. We poked at the laptop keys with two pens, since the suit gloves aren’t dextrous enough to hit the keys accurately. Brian, Luis, and Darrel had previously worked out a system of hand gestures to communicate while collecting data, because we had to turn our suit radios off (they could cause interference with the data collection). So I’d enter the coordinates, Brian would wave vertically to Luis, Luis would swing the hammer, the laptop would beep happily when it detected the shot, and we’d repeat. When three good shots were collected, Brian would wave his hand horizontally and Luis would advance to the next location. I’d disarm the geophones while Luis moved, then re-arm them once he was in position again. One thing we had not anticipated was how quickly running the laptop from the ATV’s battery (via an inverter) would drain the battery. After a couple of hours of data collection, the next time we tried to tow the land streamer, the rover almost wouldn’t start. Duh! Of course you need to run the rover for a little while each time and let it charge the battery. We didn’t have trouble after figuring this out. Soon we’d settled into a great routine and were collecting shot data with high efficiency. Near the end of the sixth line, though, I noticed that the sun was touching the far horizon, and we decided that we’d have to stop at the end of that line. We finished the shots and started packing up as quickly as we could. At that point we realized that we were somehow short on bungee cords—and two snapped while we were strapping them on. So things weren’t as secure as we would like. 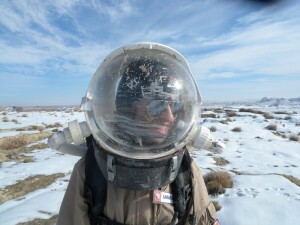 Also, Luis was the only one with a headlamp, which was a bad oversight on our part. It was nearly dark by the time we started for home. But our rovers have great headlights (if they didn’t have lights, we obviously wouldn’t have stayed out so long). In fact, visibility wasn’t a problem at all, and it felt perfectly safe heading home. The problem instead was with the strapped-on equipment. I had the laptops in a hard case strapped on the front of Spirit, but they were resting on that wretched heavy metal plate we used for shots. The plate was both smooth and had snow on it, which was a recipe for a very low coefficient of friction. Plus, the bungee cords weren’t really strong enough to hold the laptop and the plate in position. So every little bump in the road was causing the case to slide around. I started holding the case with my left hand and driving with my right (where the throttle is) but this definitely is not ideal on an ATV. Finally, after crossing an unusually bumpy mini-gully, I felt the case slide more than usual and decided to stop. I guess Luis was close behind me, because his rover bumped into mine (but not hard). We climbed off and fiddled with the bungee cords. Brian, who had been in the lead with a faulty radio, finally realized that we weren’t with him and turned around and came back. We strapped the laptop case on the back of Spirit (on top of the sledgehammer) and set off again. This was much more secure, and the driving went more smoothly—until the plate started moving on its own and I realized that its bungee cord had popped one end off. I stopped (no impact this time), reseated the cord, and headed off again. This happened a second time. The third time, I was heading into a ditch and the plate slid off the front of the ATV. I let it go, since unlike the laptop case it wasn’t worth diving for to save. I stopped, climbed off, picked it back up, and Luis and Brian strapped it more securely. We then cautiously motored home, our speed limited far more by our burdens than the night conditions. 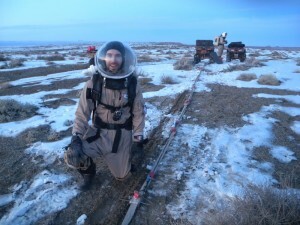 Luis and Brian also had challenges—the bulky geophone boxes strapped on the back of the ATVs prevented them from fully sitting down, because our suit packs stick out so far behind us. You can view the full EVA 18 information, including a map. We arrived back to the Hab at 6:45 p.m., and never was that airlock so welcome! Darrel and Mike were waiting inside and helped us out of our suits. 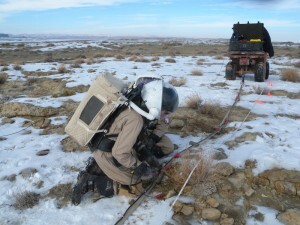 We removed packs, helmets, radios, gloves, hats, gaiters, boots, cameras, GPS units, etc. and climbed wearily up to our living quarters. Thank goodness, Carla had a hot meal waiting for us on our return!